I am one year shy of thirty years as an adoptee. 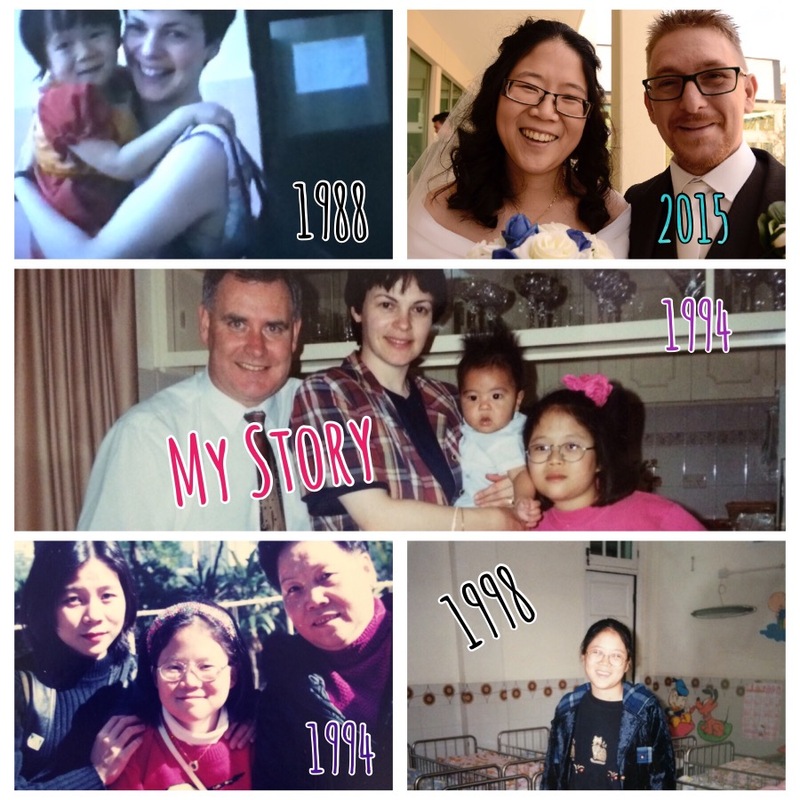 When I was three years old, I was adopted by the couple that I have called mum (Australian spelling) and dad since the day they picked me up – on my third birthday – from the orphanage in Hong Kong. I turn thirty-two in October of this year. My story is a happy one. I was one of the blessed ones who ended up with a happy ending. Though, of course, it isn’t an ending at all. My life is a series of journeys that I share with the people I love. The beginning of my journey I don’t remember much of, only what my adoptive parents, and then my birth mother and Paw Paw have told me. My birth mother was seventeen when she gave birth to me. From what I’ve gathered, the “father” was some guy from school that she had a fling with and the pregnancy was not expected. I don’t know the full story and I honestly have no interest in finding out any more about him. My birth mother and her parents raised me as best as they could for the first few months of my life until I fell seriously ill. They couldn’t afford the hospital fees, so they were convinced to relinquish guardianship to the state. The officials promised them that a family in Hong Kong would adopt me quickly; however, I ended up in Po Leung Kuk for almost three years. I have no recollection of my time in the orphanage. I do know that my time there has shaped many of my habits (protectiveness of food, introvert nature, etc.) and my personality. But, I have no true memories of my time there. I did go back to visit Po Leung Kuk in 1998 with my adoptive parents and there were still a couple of the caregivers from when I was there. I didn’t recognize them, but they remembered me, so there were obviously attachments formed at least from their end. In October of 1988, a couple from Australia made their way to Hong Kong to pick up a little girl who did not realize she was about to find her forever home. A story has been told that a friend of my parents back in Australia who spoke Cantonese had to explain to me that I wasn’t on “holidays,” that I wouldn’t have to go back to Hong Kong. When mum and dad brought me home to Melbourne, it was my third birthday. We lived there happily for another seven years. My adoptive parents brought me up in the Presbyterian tradition, taking me to Sunday school and church services. We still talk of God’s providence in my life and theirs: their approval for adoption happened on the day I was born, before either party knew the other existed, for example. I’m still a part of the Church today, my larger adoptive family. In 1994, my parents decided that they should track down my birth mother. The journey probably started prior to that year, but I only realized and understood as planning for the trip to Hong Kong was happening. I have no recollections of how I felt. I’m sure I was excited and perhaps a little nervous, but that first meeting is just an image in my mind…or more to the point, an image of a photo of me sitting with my birth mother and Paw Paw. To be honest, I have no real feelings about any time I met my birth mother in the years since, either (1998, 2005, 2009). Just vague memories… Sometimes I wonder what I would feel today if I met my birth mother for the first time again, though that’s often only a passing thought. Perhaps this is because it was also in 1994 that we adopted my younger brother (not blood related). Or perhaps nothing would change, since I’ve always considered my adoptive parents to be my real parents, as it should be. A couple of years later we moved to North Queensland, where I completed my high school years. I probably faced racism in school, but it wasn’t something that ever fazed me any; to me, it was just part of the ingrained culture of high school. In hindsight, it really only highlights that children can be cruel and ignorant. I never let it get to me, though. I even had to have a teacher point out to me that another student was bullying me…weird, right? I’m a reserved person, and even if something is going on that is challenging me, or that is upsetting me, I often don’t ask for help. Whether that stems from my days in the orphanage or something that happened after that…I’m not sure, but who I am is informed by those early days. In 1998 we visited Po Leung Kuk, where I was placed when I was a baby. As I mentioned before, there were workers there who still remembered me. This same trip, we met my birth mother and Paw Paw again and we also met my brother’s birth mother, as well. We moved to Perth, Western Australia in 2006, and the next chapter of my life began. I became stronger in my faith as a follower of Christ and I made some lasting friendships within church circles. I completed a teaching degree and, in 2010, began working in childcare/early learning, which I am still doing today. And then, in 2015, I met Mark: my wonderful husband. And what are the odds? He was adopted too, from England. In fact, I married into a family of adopted people. His sister and brother-in-law were adopted as well. Adoption can be special. Adoption is the family that is chosen. Adoption is about love. I am blessed to have been adopted into this larger family of life. Being adopted has afforded me opportunities in life that I may have never had if I hadn’t been; I am forever grateful for that fact.